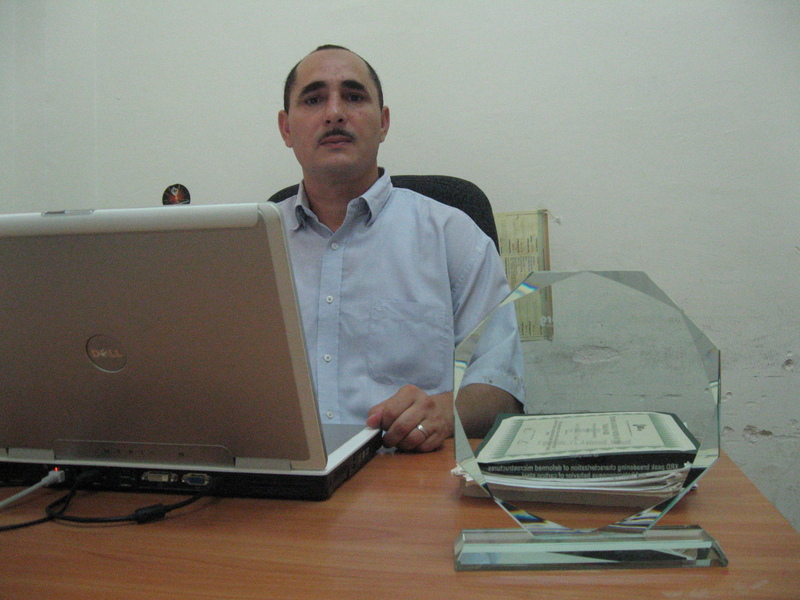 Dr. Boumaiza Ahcene is Associate Professor at the Department of Physics, University of Jijel with research interests in the properties of physical materials. He received the high studies degree (D.E.S), a Master degree (Magistère) and a Ph.D degree in Physics in 1992, 1995 and 2008, respectively, all from the University of Constantine. Inspire Magazine spoke with Dr. Boumaiza to find out more about his work which won him and his coauthors the prize of the 2013 Algerian of the Year Award in the category of Physical Sciences & Mathematics. The winning paper, published in the journal of Theoretical and Applied Fracture Mechanics is entitled “XRD peak broadening characterization of deformed microstructures and heterogeneous behavior of carbon steel” and can be accessed here. Inspire Magazine: Thank you for speaking to Inspire Magazine, and many congratulations for winning the 2013 Algerian Paper of the Year Award in Physical Sciences & Mathematics. How do you feel about winning this award? Ahcene Boumaiza: It was an important moment in my professional life. IM: In simple terms, what was your award winning paper about? AB: The paper looks at how to improve the quality of carbon steel, which is widely used in the industry of automotive sheet components. In these applications, a property known as the anisotropy of plastic intervenes with the behavior of the material and in certain cases, under the influence of complex mechanical loading, the development of this anisotropy can lead to a critical stress state that can provoke a localized formation of micro-bands, local thinning or micro-cracks. So the industrial problem for these types of sheet is to avoid the initiation and propagation of cracks during the fabrication process. The objective of the study reported in the paper was to propose and apply a simple method to determine the variation of the degree of the plastic deformation in different zones using a set of complex geometry. This variation can help in choosing the right manufacturing conditions in order to avoid any premature fracture. More specifically, we described an empirical relationship that allow us to obtain the degree of plastic deformation or the hardness from the diffraction peak broadening. The method we proposed is rapid and requires minimum data collection making it suitable for routine analysis of deformed surfaces of mechanical components. AB: It’s important because the problem of sheet steel cracking during the process of fabrication is very common in this industry. Any improvement of the manufacturing process that results from the method we proposed, as well as that of the exploitation of the properties of these products will be economically interesting and so makes this an important area of research. Like I said, the problem for the considered sheet is how to avoid the initiation and propagation of cracks during fabrication by deep drawing. Sheet steel is generally characterized by a marked structural anisotropy that results from different stages of the manufacture cycle: hot and cold rolling, recrystallization, and grain growth of grains. Currently it is well established that a characterization of the global mechanical properties is not enough for the qualification of drawing sheets. In a complex geometry during deep drawing, the resistance in a given point depends on the whole deformation of the material and so any manufacture by drawing requires a previous determination of the superficial mechanical properties to define the structural characteristics of the sheet in relation to the drawing sample geometry. AB: The contribution of the paper is the characterisation of the anisotropy behaviour of carbon steel by peak broadening. This is a novel and accurate method of characterisation. Our approach can be considered as a complement to other approaches in the field. The exact details are as follows; We can only obtain good formability with materials that deform in a homogeneous manner i.e. isotropy. Otherwise what we end up with is a poor surface finish which increases the likelihood of premature failure. Deformation is only homogeneous when it satisfies stability in three orthogonal planes of symmetry defined by the rolling direction, the transverse direction and the thickness direction of the sheet. In this case, the sample continues to deform in the weak section until fracture. In heterogeneous deformation i.e. anisotropy, the plastic deformation is generally irregular in the three orthogonal planes of the sheet causing rapid deformation localization at mesoscopic scale (grain scale) and therefore an early crack. Many metals, particularly low-carbon steels, show a localized, heterogeneous type of transition from elastic to plastic deformation. AB: This work has been done in collaboration with a french research team. The support that I have received is the equipment that I used for my experiments. IM: What kind of equipment is that and why is it not available in Algeria? AB: The main equipments used in this work are the XRD (X-Ray Diffraction) peak broadening analysis and the EBSD (Electron Backscattered Diffraction). These equipments are available in Algeria, however some technical and organizational problems prevent their correct use. There is a convention between our laboratory and the ICMMO, UMR CNRS 8182, laboratory Orsay, France, which permits us to exploit their equipments to analyse our samples. IM: So, how did you get into this particular research and where does it fit in relation to other work conducted in your research lab or institution? AB: Well I am a physicist and I specialized in Materials so this particular topic falls within my research interests. Our laboratory is active on several research areas including physics of materials which makes it possible to supervise several Master students and researchers at Doctorate level. The overall objective is to develop relationships between our laboratory and the industry. AB: At this moment, only few researchers are active in this type of research because it requires very accurate and sensitive instruments to conduct experiments. However, I think that this type of research is in progress because it has the potential to open a broad range of perspectives. Indeed, the thin flat products are among the most important productions of iron and steel industry which makes this kind of research very pertinent.